Rail integrity is a current application of engineering fracture mechanics at a practical level. Although railroad rails have been manufactured and used for more than a century, it is only in the last ten years that the effects of their crack propagation and fracture characteristics have been considered from a rational viewpoint. The J,Jractical objectives are to develop damage tolerance ~delines for rail inspection and to improve the fracture resistance of new rail productiOn. Rail fatigue crack propagation rates and fracture resistance are strongly influenced by residual stresses, which are introduced into the rail both during proouction and in service. Therefore, the rail residual stress field must be well understood before fracture mechanics can be usefully applied to the subject of rail integrity. The three-dintensional character of rail and its stress fields make it essential to apply both experimental and analytical methods in order to twderstand the effects of pro­ duction and service variables on residual stress and the effects of the stress on fatigue crack propagation and fracture. This volume brings to~ether field observations and experimental stress analysis of railroad rails in the Umted States and Europe. The ongoing search for an efficient and accurate technique is emphasized. 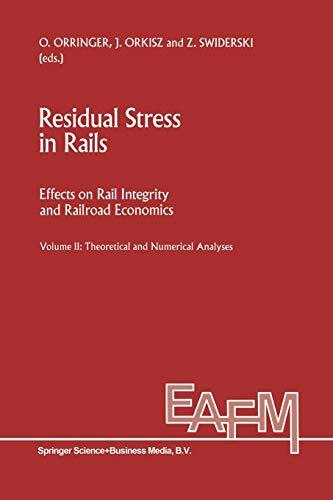 A companion volume brings together several analytical investigations, based on advanced compu­ tational mechanics methods, for correlation of the experimental data as well as eval­ uation of the effects of residual stress on rail integrity.